I’ve been working to make myself unnecessary since I started my marketing agency, MWI, in 1999. This is different than making myself useless or irrelevant. When I started my agency while a college student at BYU in Provo, Utah I began by freelancing as a web designer and I called myself an “agency.” Things went well working on my own until several months later in 2000 when I brought on two partners and we rented some office space. Going from one member on the team to many, renting office space, and managing employees brought new challenges I wasn’t prepared to take on, and we struggled. However, we worked hard, we survived, we had some successes, and while nobody got rich, we did ok. In 2003 we went through a buyout which left me working on my own without a partner. “Good riddance to partners!” I thought. I didn’t want to be tied down. I thought I knew what I was doing, and I was going to show everyone what a genius I was. I secured $100,000 in the form of an SBA loan, and dove in to create my dream company. It turned out I was something less than a genius. I worked hard, harder than I had ever worked before, but the company was constantly on the edge of going out of business. So I worked harder. I worked 100+ hour weeks and slept on the floor of my office. I worked every Saturday for years. I missed birthdays, family reunions, and weddings. I went four straight years without taking a dime out of the business. No paycheck, no dividends–nothing. In 2007 I burnt out. I knew my business had the potential to be successful, but I was clearly doing something or many things wrong. Other companies had started up, grown, thrived, and been bought out, all while I was failing to pay the bills on time or give myself a paycheck. I didn’t know what I was doing wrong or what I needed to change. All I knew was that what I was doing wasn’t working and if I didn’t cut back on how much I was working I was going to die young. The only options I had were painful. I got rid of our nice office space, which meant I couldn’t tell people “Yeah, that’s our office you see with our logo on it right off the freeway. Cool, right?” I put my 10 full time employees on contract, which meant I could no longer tell people, “Yeah, we’ve got a team of 10 full time people in our office.” I retreated to the basement of the townhouse where my wife and I lived. MWI was back down to a team of one plus a handful of contractors. I had never felt like a bigger failure in my life. And yet this is when I started to succeed. For the first time instead of going into debt every month I was paying off debt. It didn’t feel like success, but if you’re paying off debt, you’re profitable, and it’s just a matter of time before you can enjoy it. I brought on a partner, Corey Blake. Corey was strong on sales, which was a weakness of mine. He’s also a bit more of a people person, or at least a different kind of people person, so he could work with people in ways I wasn’t well suited to do. I started writing for Forbes. This was less a conscious change and more a stroke of providential dumb luck. By the end of 2013 MWI was ready to reboot. Corey and I started almost from scratch and MWI began to grow again. Although we had never done more then $500K in any prior year, we shot past $1M within the first 12 months and now…well, this blog post can’t keep up but MWI is firmly a multi-million dollar agency. On top of that I haven’t worked a single 80-hour week since our reboot, and I get a paycheck. My philosophy, the way I understood work and business changed. With MWI 1.0, when I got busy I worked more. But this graph illustrates the problem with doing things that way. Doubling my time at the office wasn’t enough. It wasn’t enough back in 2003, and it’s still not enough today. Time management and investing in productivity also aren’t answers. Working more, either because you’re working more hours or working more efficiently, may boost results and sure, productivity is important, but an entrepreneur doesn’t scale his business from $1M to $100M by being more efficient with his own time. 1. I’m doing good things that aren’t essential. Reading the news is a good thing. It’s good to be informed about what’s going on in the world, right? But if my goal is to grow my business to $100M in revenue during the next two years then reading the news may not be essential (unless it’s relevant to your business). 2. I’m doing better things, but they still aren’t essential. Spending time on Twitter is relevant to my business. There are opportunities to network with peers, form partnerships, and find clients. This may be a better use of my time than reading Drudge Report, but is this the best use of my time? Is it truly essential? Just because it’s better than something else doesn’t justify it. 3. I’m inefficient in how I do the best things. Even when I’m doing things that are 100% essential to my business and only expending effort on what is the best use of my time, I may be doing my work in a way that wastes time. This is where productivity hacks come into play, like David Allen’s two-minute rule, or the practice of batching email so that I’m not constantly being interrupted throughout the day. 4. I’m doing things somebody else should be doing. This is the big one. I may be doing things that are 100% essential to my business, but it’s not 100% essential that I do them. In a startup even if you eliminate good and better things that aren’t essential and maximize your efficiency you’ll still find yourself at #4 realizing there is still too much that is essential compared to what you have time to do. That doesn’t mean you should ignore time management and productivity improvements, but you must recognize that improvements in these areas are not enough. How much can you improve your efficiency? 10%, maybe 20%, maybe even 200%? It’s still not enough. No matter how much you improve, there will still be more opportunities for your time than you have time to take advantage of. If you want to grow your business then making yourself efficient is important, but making yourself unnecessary is critical. At MWI 1.0 I tried to do everything. Even when I had 10 people working for me I tried to do way too much. I should have given up, but I was stubborn. At MWI 2.0 I started out by giving up. The first thing I gave up on was sales in the U.S. I looked at sales and told myself “Josh, you’re not very good at this. Find someone who is better.” I found someone better. That was Corey. He became my partner at MWI. Turns out he’s good at a lot more than sales. But I was still doing sales in Hong Kong, where I had moved and where we were opening a new office for MWI. I tried to give up sales, but it took me a while to find the right person to give it up to. I found that person. As soon as I gave up sales, it freed up a large chunk of my time. I then gave up account management. 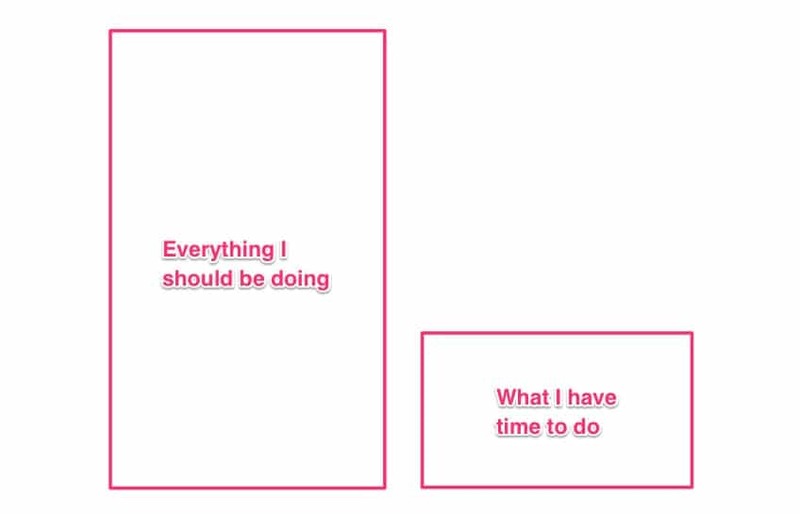 I took “everything I should be doing” and gave it to other people who were better at it than I ever could be. 90% of what I was doing six months ago I no longer do at all, and the business is better for it. I gave up on my business, and it was the best thing I ever did. Of course a funny thing happens when you make yourself unnecessary and give someone else your work–you find something else to do. And that’s the point. Millions of books have been written to answer the question “What should I do right now?” It’s the root of classics like The 7 Habits of Highly Successful People by Stephen R. Covey and Goals! by Brian Tracy as well as new best sellers like The One Thing by Gary Keller and Essentialism by Greg McKeown. Every book on parenting, business, education, and self-improvement seeks to cure our confusion and tell us how to allocate our time and other resources. Despite all these books as well as millions of articles, videos, and seminars, most of us ignore the advice we receive and do whatever seems most urgent at the moment. Today, instead of letting events manage me, I manage events. I start out by setting big goals. One of my goals is to turn MWI into a global, 500 person agency. That means MWI needs a lot more leads. In the old days I would have asked myself “What can I do to generate more leads?” but with a goal this big I can’t do it by myself. I need a marketing team that is self-sufficient and can get the job done without me. Then it becomes a question of how much I step in. If I involve myself am I inspiring the department to new heights, or am I a crutch, holding them back from finding their own permanent solutions? It’s easier said than done. I may want to hire an administrative assistant to take care of admin tasks I currently do myself, but do I have that money laying around? If not, I can’t make that hire, and I have to continue doing admin work. As frustrating as it may be to do work someone else can do while work only you can do goes undone, that’s often the reality of entrepreneurship. The larger challenge is giving up, letting go, and delegating. There are many founders who, after they have plenty of money, cannot resist the temptation to be involved in the details of their businesses in ways they shouldn’t be. Imagine you take care of marketing at your company, but then you decide it’s something you should outsource. You hire a marketing agency, but then you micromanage every move they make. You now pay out valuable cash to make yourself unnecessary so you can focus on other things that need your attention, but you’re not enjoying any increase in your available time, and the business is missing out on the extra benefits your free time could bring, because you’re spending just as much time managing the marketing agency as you were spending before doing the marketing yourself. As I explained in Why You Should Never Micromanage Your SEO Firm, if you’re micromanaging an agency you should either fire the agency or you need to trust them and step back and let them do the job you’ve hired them to do. Founders, managers, and others also have trouble letting go because they think “If I get other people to do this work, what will I do? Maybe I won’t be valued at this company.” This ends up being counter-productive thinking, because it’s precisely those leaders and managers who let go and delegate whose departments and companies have the chance to be more successful. There are cases where a boss doesn’t understand this and fires a great manager because he thinks “I can just have these cheaper people do the work now that he’s made himself unnecessary…” That’s shortsighted thinking, and if you work for that type of boss it’s probably time to get a new job. It’s hard to let go, but I now have a simple process. I look at everything I do and ask myself “Can someone else do this?” If the answer is yes, I create a plan for how to pass it off. If not today, then tomorrow. In order to execute this type of plan I need to hire people I can trust. I don’t worry anymore that people will think I’m useless just because I’ve made myself unnecessary. I know I’m going to have plenty to do, and as I focus on my highest competency I will be more valuable to the company than ever before. In addition to goals I set, I also use thought experiments to help me see how I can make myself unnecessary. One thought experiment, which I am working to turn into a reality, is to take a one-month, disconnected vacation. Who would do marketing and generate leads? Who would take care of an emergency with clients A, B, and C since I have the strongest relationship with them? What if something went wrong with essential software we use that only I have the usernames and passwords to? In each case there is a solution, and implementing the solution allows my business to grow. Unnecessary does not mean useless. In fact, when you make yourself unnecessary, you become more useful to the business than ever. It’s hard to do, and it can also be hard for others around you to understand, but open and frequent communication can smooth out bumps with your team, and they’ll not only assist you in the process, but they’ll follow your example and take steps to make themselves unnecessary, which will further allow your company to scale. What about you? 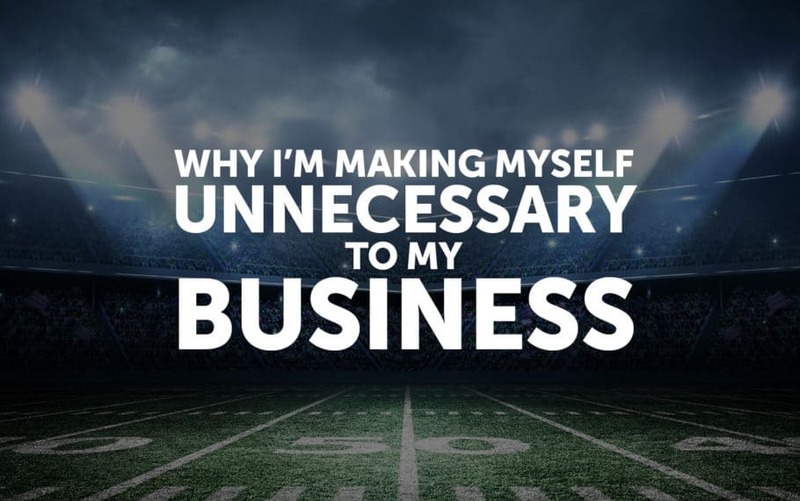 What steps have you taken to make yourself unnecessary in your business? What frightens you about becoming unnecessary? Tell me in the comments below.